Everyone needs an easy waffle recipe in their arsenal! This simple recipe, only calls for 7 ingredients and creates fluffy on the inside and crispy on the outside waffles! With this one easy waffle recipe you can create virtually any flavor of waffle you could ever want! This is the only waffle recipe you will ever need! Making waffles from scratch is actually quite an easy process! Just like my easy pancake recipe, the process of creating a waffle batter uses “The Muffin Mixing Method.” If you’re interested in learning more in depth information about this mixing method, you can read my post about it here. In short, to make waffle batter the dry ingredients are whisked together and then the wet ingredients are added to the dry ingredients. The ingredients can all be mixed together in one bowl and then your waffle batter is ready to go into your waffle maker. Personally, I always find that knowing the purpose of each ingredient in a recipe is helpful with the success of creating a dish! I will go over the function of each ingredient briefly and discuss substitution options in case you may need to change an ingredient. All of the dry ingredients are whisked together in a large bowl before any of the wet ingredients are added. Flour: This is the structure of your waffles. I typically use all-purpose flour for my waffles, but you could definitely substitute for whole wheat flour if you prefer. Cake flour or pastry flour would also work well in these waffles if that is all you have on hand. Both cake flour or pastry flour will create a much more delicate and tender waffle. Tip: If you want to make this recipe even more simple and you happen to have self-rising flour on hand, you can use that and omit the salt and the baking powder in the recipe! Sugar: In a waffle recipe, the sugar is actually completely optional. The main purpose of the sugar in this particular recipe is to add sweetness. I tend to lean towards using only a little bit of sugar. The amount called for in this recipe will give you slightly sweet waffles. I think this is the perfect amount, especially if you are topping them with syrup or other sweet toppings. You can definitely increase or decrease the amount of sugar to match your own preferences. Note: Increasing the amount of sugar will create a slightly crispier waffles while decreasing will give you softer waffles. Salt: Salt really is a key ingredient in all baked goods. The amount of salt in this recipe will not make salty waffles, rather it simply balances the flavors. Leaving out salt in this recipe will make waffles that taste flat. Baking Powder: Baking powder is the leavening agent in this recipe. That means, it helps the waffles to rise and become more fluffy and tender. If you are really in a pinch and do not have or are unable to use baking powder, you can make this waffle recipe without baking powder. However, your waffles will be a bit less fluffy and tender than if you did use the baking powder. The wet ingredient are then added into the bowl with the dry ingredients and are stirred together just until the batter comes together. Stirring too much will result in tough waffles. Milk: The purpose of milk in this recipe is to add moisture and to hydrate your dry ingredients. The milk in this recipe can really be any kind. I usually have regular 2% milk on hand, so that is what I typically use. If you happen to have buttermilk, it adds a certain tanginess that is quite lovely in this recipe! You could use skim milk or whole milk or non-dairy milk if you need a waffle recipe without regular milk. Any of these options will work well! 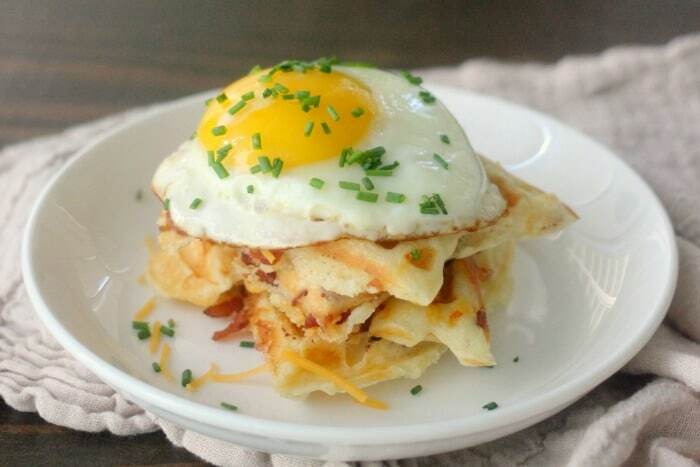 Eggs: Eggs are the binder in this recipe. They are what holds the waffle together and they also help to leaven the waffles a little bit. Vegan egg substitutions can be used, but please note that using flax or chia egg will result in more dense waffles. The best vegan egg substitution would be EnerG Egg Replacer. Oil: In a waffle recipe, the oil or liquid fat, serves several purposes: flavor, browning, and texture. I typically use canola oil here, but you can use any liquid fat really. You could even use melted butter or bacon fat in these, both of which I’ve done with delicious results! The beauty of this easy waffle recipe is that it is a blank slate! These waffles are quite delicious served simply with butter and maple syrup. But you could also flavor the actual batter or add various ingredients to make any kind of waffle you desire! Spices and Extracts: Adding a spice or an extract is probably the easiest way to flavor this batter! Some ideas of spices you might want to try are: cinnamon, nutmeg, cardamom, or pumpkin spice. Some ideas of extracts that you could try are: vanilla, almond, anise, or lemon. All spices and extracts have various potencies, so I suggest adding just a little bit at a time and tasting the batter to decide how much you want to add. Fresh Fruit and Nuts: Berries, such as blueberries, raspberries, and strawberries, are always delicious additions to waffles! Bananas are also a hit! I love pairing these with different nuts, such as: walnuts, pecans, almonds, or hazelnuts. Sweet Things: This is where you can get really creative! Of course chocolate chips are a staple addition to waffles, but what about adding a sweet cereal like Fruity Pebbles or Captain Crunch? Chocolate Chip Waffles: Mix mini chocolate chips right into the batter or sprinkle on top of the batter before you close the waffle maker lid. Serve with whipped cream on top and a sprinkling of more mini chocolate chips. 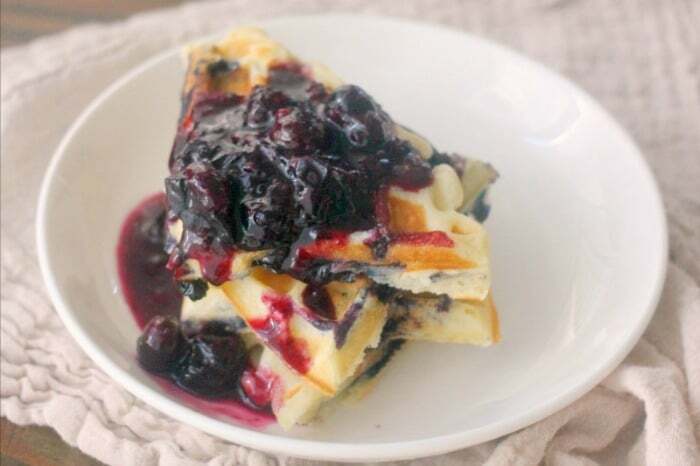 Blueberry Waffles: Add fresh or frozen blueberries right into the batter or sprinkle on top of the batter before you close the waffle maker lid. Top with blueberry jam or blueberry syrup. 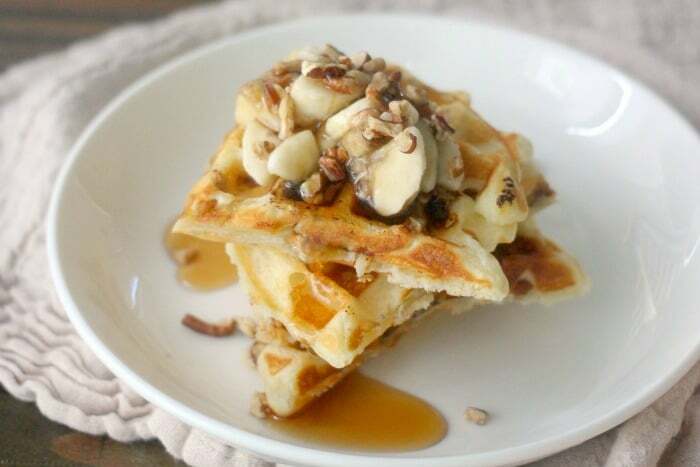 Banana Pecan Waffles: Add fresh diced bananas and chopped pecans right into the batter or sprinkle on top of the batter before you close the waffle maker lid. Top with more fresh diced bananas, diced pecans, and warm maple syrup. 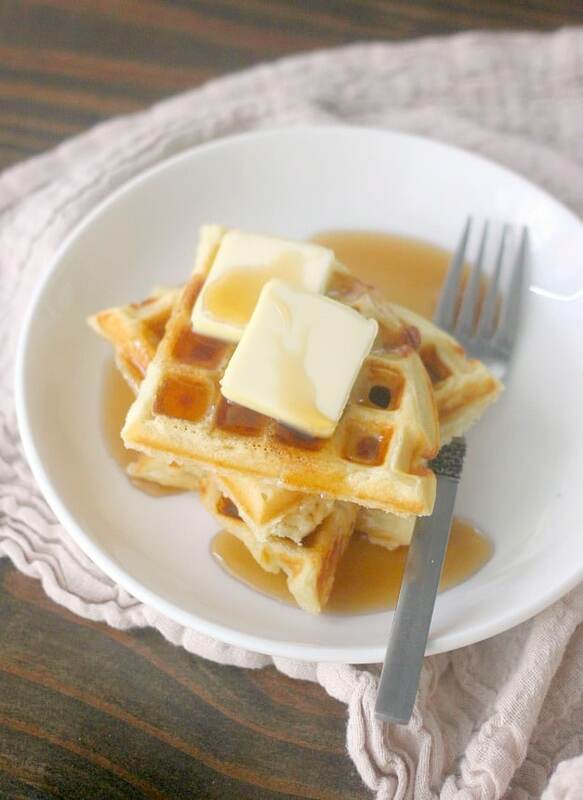 Cheddar Bacon Waffles: Add shredded cheddar and crumbled cooked bacon right into the batter or sprinkle on top of the batter before you close the waffle maker lid. Top with more cheddar, a fried egg, and chives. The flavor variations I listed above are just a few options of the endless combinations you could create! I love to leave the actual batter for these waffles plain so that I can create many different kinds of waffles with one batch. I definitely recommend checking out the video below to see just how quick this easy waffle recipe comes together! The video also show you how easily I transform the simple waffles into the different flavor variations! The one easy waffle recipe can be used to make the best simple waffles or to make endless variations! This is the one waffle recipe you will ever need! 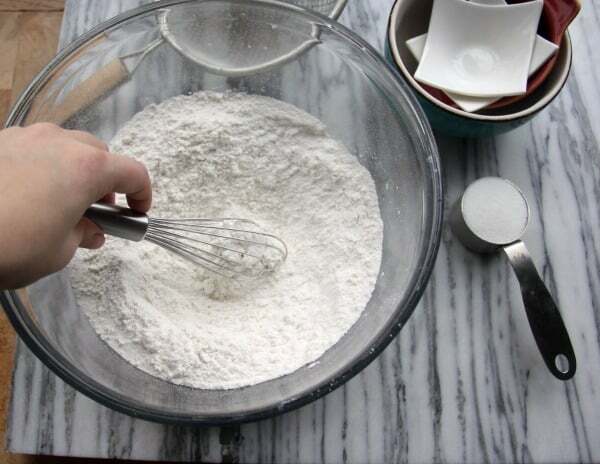 In a large bowl, combine the flour, sugar, baking powder, & salt. Whisk together until thoroughly combined. Add the milk, oil, and eggs into the bowl of the dry ingredients. Use a spoon or a rubber spatula to mix all of the ingredients together until combined. Do not over-mix your batter. If you are adding any additional flavorings, extracts, or mix-ins directly into the batter, you can stir them in at this point. Preheat your waffle maker to medium heat and spray it with non-stick spray. 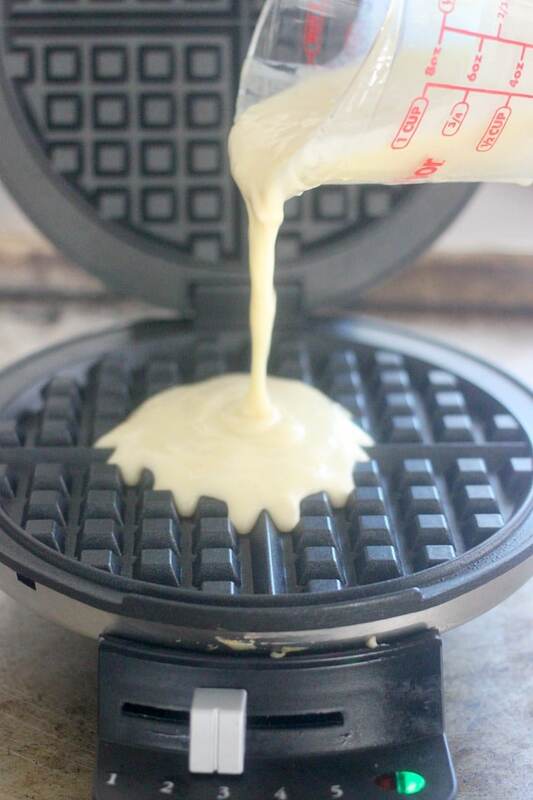 Using the recommended amount of batter for your model of waffle maker, pour the waffle batter directly into the center of the preheated waffle iron and close the lid. If you want to add mix-ins right into your individual waffle, you can sprinkle them on top of the batter right before you close the lid. Waffles are best eaten immediately, but you can keep them warm in a 200F oven. I like to place a cooling rack over a baking sheet in the oven to set the waffles on. This helps the crust maintain crispiness. For Chocolate Chip Waffles: Mix mini chocolate chips right into the batter or sprinkle on top of the batter before you close the waffle maker lid. Serve with whipped cream on top and a sprinkling of more mini chocolate chips. For Blueberry Waffles: Add fresh or frozen blueberries right into the batter or sprinkle on top of the batter before you close the waffle maker lid. Top with blueberry jam or blueberry syrup. For Banana Pecan Waffles: Add fresh diced bananas and chopped pecans right into the batter or sprinkle on top of the batter before you close the waffle maker lid. Top with more fresh diced bananas, diced pecans, and warm maple syrup. For Cheddar Bacon Waffles: Add shredded cheddar and crumbled cooked bacon right into the batter or sprinkle on top of the batter before you close the waffle maker lid. Top with more cheddar, a fried egg, and chives. If you want to make waffles without dairy milk: You can substitute any non-dairy milk such as: almond milk, soy milk, coconut milk, hemp milk, or cashew milk. If you want to make waffles without eggs: You can use vegan egg replacements. EnerG Egg Replacer will work the best, however chia or flax egg will also work. If you want to make waffles without baking powder: You can omit this ingredient, however your waffles will be a bit more dense. OOh these look divine! They will pair perfectly with the apricot jam-turned-sauce I made last weekend. Breakfast tomorrow, I can’t wait! Does the recipe call for 1 or 2 cups of flour? The video says 1 but the recipe says 2. Thank you for replying! Yes, 2 cups! Thanks Baker Bettie! I just made these and they are delicious! Thanks so much lady! It helps my brain understand to be a better cook and baker! That’s so great to hear Micki! I don’t specifically have a recipe like that, but these waffles toast up from frozen really well! I would make a batch, let them cool completely, wrap them in plastic wrap, and then freeze them. You could then throw one in the toaster or toaster oven whenever you want one! Thanks for posting this very simple recipe. Sometimes the simplest things are the best things. I love good old fashioned waffles but now it seems the only way to get them is to make them yourself. Most restaurants serve Belgian waffles and most waffle makers make them as well. I have an old waffle maker that does ok but is sure to die someday. I noticed yours has a variable control. What brand is it? Has anybody found a classic style waffle maker they love? Please share. Sorry for only 4 stars, the flavor was very good but the outer crispness was good not great. Probably my waffle maker and not your recipe. Hi Ed! Glad you enjoyed them. I have the standard Cuisinart waffle maker. It doesn’t have the deep wells like Belgian waffle makers do. I have made these waffles many times and this is the recipe that got me hooked on everything Bakerbettie has. 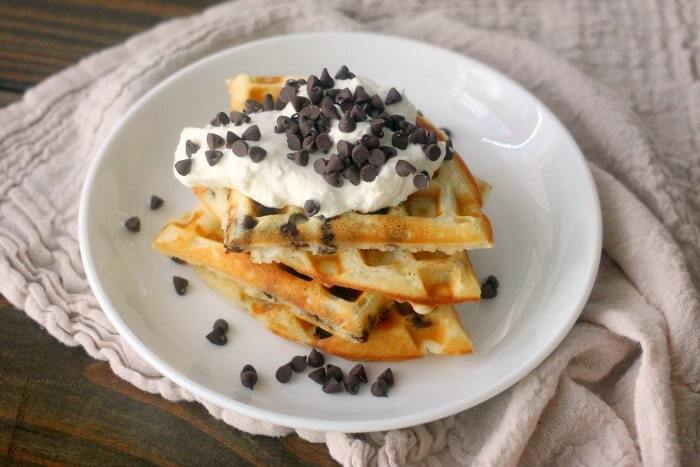 They were absolutely perfect and she is right….you’ll never need another recipe for waffles! Her instruction on the ingredients really helps you know if you have enough of this or wanna change that! That’s so great Micki! Thank you! I have a question. You have that 1 3/4 cup of milk is 28 fl oz. Wouldn’t it be 14 fl oz? Just made these with my dsughters. We normally just buy the mix and make them but we dared to do homemade this time and these were perfect..
I’m so glad you and your kids enjoyed these Melissa! I hate the taste of baking powder in waffles and appreciated the permission to skip it or at least use less. I used two tsp instead of 1 TBSP and it was great. My daughter and I made it together (she’s eight). We enjoyed adding things to the batter before we closed the lid. It came out great and we had a lot of fun. Thanks for the recipe and the ideas!! So glad you enjoyed these Batya! Do you use aluminum free baking powder? That can really help with not tasting it! What can I say..this recipe rocks! Hi Nicki! I’m so glad these work so well for your B&B and glad to know that egg substitute works well! That makes me so happy! Also, if I were to use melted butter instead of oil, will it be 1/2 cup of melted butter or to melt 1/2 cup of hard butter? Will reducing it to only 1/4 cup affect the texture of the waffle as well? Hi Cherale! If they are just lightly whisked it really won’t make that much of a difference. But beating them quite a bit could. The best way to make them crispier would be to use a good amount of fat on your waffle iron while they are cooking. 1/2 cup of melted butter is the same as a half cup of solid butter. 1/2 cup would be equivalent to 1 stick. And yes, reducing the fat by half the amount would definitely affect the texture. You likely wouldn’t have enough moisture in your batter and they also would not get as crispy. Hope that helps! I just made these and they were my first homemade waffles. I’ve made them at work a few times many years ago and they were great but I used a commercial grade waffle maker at the time and haven’t done it since. I skipped the baking powder (ran out) and added 2tsp vanilla extract. They tasted very good but we’re definitely denser than I like – the powder will fix that for next time. My concern is that they didn’t come out at all crispy. I’m wondering if that was the dinky waffle iron I used and if it is supposed to be a super heavy iron or if you have other tips to get a crispier end product? I look forward to playing with the recipe. Hi Maria! I find that cooking on a bit of a moderate heat for a longer period of time will help get the waffles crispy as well as using a decent amount of non-stick spray in the waffle iron. The fat will help crisp them up! And yes, the baking powder will help with the lightness and actually with the crispiness too. Hi, I totally love this recipe, and I make it all the time. I was just wondering how many calories each serving (1 waffle) has, because when I go to the nutrition information section, it says each serving has 0 calories which I believe is a typo. Thank you so much, and have a lovely day! Hi, I just want to say I adore this recipe! It’s so delicious and I make it more often than I’d care to admit (oops!) I was wondering how many calories each serving has though, as when I look at the ‘nutrition information’ section it says each serving has 0 calories and I think that’s a typo. Thank you so much! I’m so glad to hear that you enjoy these! The recipe card just entered “0” because I do not calculate calories for my recipes. But I just entered this quickly into a nutrition calculator and it says 400 calories per waffle. This is calculated using whole milk. Hi!! Hope you and your family had an amazing Christmas!! I just made these for a quick brunch and -as with all the recipes of yours that I’ve tried-they are the best I’ve tasted. Very simple recipe with perfect results. You are my go-to when I’m looking for a new recipe. As far as the calories go, there are no calories at Christmas 🙂 🙂 🙂 Just kidding. I’ve looked online and it ranges anywhere from 99 calories to 300 calories…..I think its really going to depend on what you put on them. Thanks again for all of your fantastic recipes!! Happy New Year!! Hi Toni! Thank you! I hope you had a great Christmas as well! I’m so glad you enjoyed these waffles. They are a staple in my house too! That is so great to hear Kristi! So glad you enjoyed them! These were so good that I made them again but this time it had baking powder which I’m guessing will make it even better. Just 2 questions 1: is it good that your mix has l little balls in it because I made one without baking powder and it did not get these little balls. 2: dose baking powder make it better worse. But over all these were amazing.‍. (Btw there is no waffle in the emoji rack thing). Hi Luc! I’m so glad you enjoyed the waffles. I’m not sure I quite understand the recipe. What are you referring to when you said that it had “little balls in it”? Like bubbles? Baking powder will lighten the waffles slightly and make them more fluffy! That’s so great to hear! Glad to hear that you enjoyed them! We’ve enjoyed the Original Waffle Recipe twice ! Our family of 6 enjoyed Breakfast for Dinner tonight. That is so amazing! I’m so glad you and your family enjoy it!